Searsia crenata (previously known as Rhus crenata) is commonly known as the Dune Crowberry. It is a proudly South African shrub that is endemic from the coastal Western Cape region to KZN. Searsia crenata is evergreen and has a dense, multi-branched growing habit. It can reach a height of 3 metres if left unchecked and works well as an informal perimeter hedge or small tree. It is however easily trimmed if needed and because of the multi branched growing habit works well as a formal hedge or clipped shape. The top of the small glossy leaves of Searsia are scalloped. They are dark green above and light green below the leaf. The Dune Crowberry is able to grow in the sun or semi-shade. 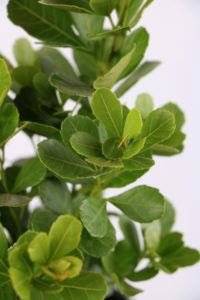 It is especially hardy and grows well in mild to warm areas and will manage light frost. In its natural habitat it is found in sandy coastal areas, it is therefore important to note that they require a sandy or well drained soil in the garden too. Searsia needs regular water to establish and once establish is water wise and drought tolerant. It is easy to maintain and fuss free. They produce clusters of cream flowers in the autumn months and these are followed by small wine-red berries. Birds just love the berries and butterflies are often seen around the shrubs. Plant Searsia crenata in coastal gardens where they will cope well with the wind, sandy soil and sea salt spray. Their dense growth ensures they make excellent wind breakers and large screening shrubs. They can also be used to help bind sandy or easily eroded soils. They make a beautiful clipped hedge and can be planted in a container and shaped. Great for bonsai enthusiasts!